CIO Predictions for 2019 | Constellation Research Inc. It will be another interesting and eventful year in 2019, both in terms of opportunities as well as significant challenges, for Chief Information Officers (CIOs) around the world as they attempt to navigate an increasingly turbulent digital operating environment. It's an environment that's very much in the midst of major and ongoing systemic change in the collective technology and business landscape, both internally and externally to their organizations. There's also no question that these market dynamics must be successfully navigated and exploited, yet only if the CIO has the resources and sufficient organizational posture. We'll get to the exact nature of the changes below, as well as what we think CIOs will do about them this year. Making the overall task more complex is that these shifts are taking place on a backdrop of rather confounding forces: Ever-faster tech change, profound cybersecurity concerns, substantial regulatory changes, rapidly evolving customer preferences, and an overarching scarcity of talent that's ready and able to help cope with these shifts. This means coping with immediate fires and obstacles has often resulted in an epic struggle to adequately deliver on key strategic multi-year objectives, vital to the attaining the largest payoffs in IT. The inability to do so is perhaps one of the main indicators of an organization that has become reactive to the forces that affect it. Instead, CIO success more than ever today means proactively setting the agenda and driving the business as well as the broader industry forward with an integrated and disruptive business vision based on effective new digital capabilities. 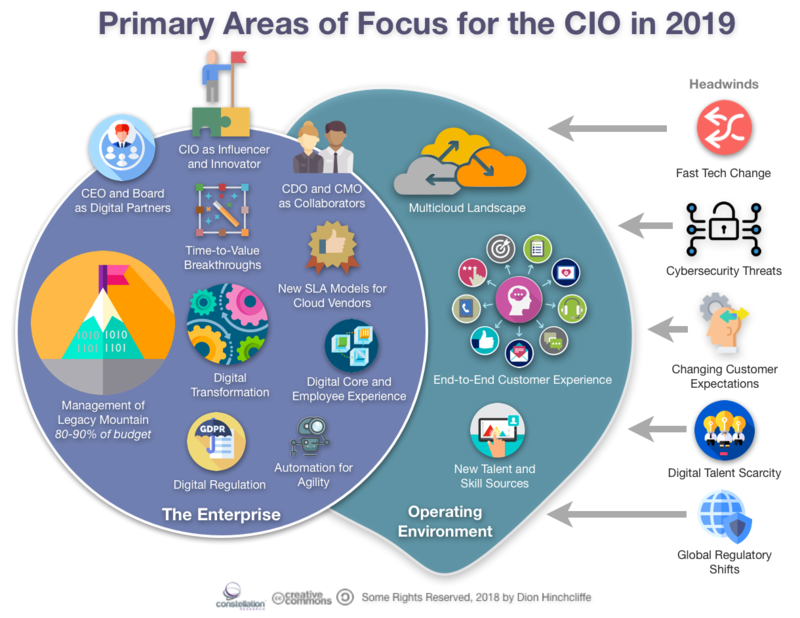 What then is in store for the CIO in 2019? The real choice is stark: The top IT executives in today's rapidly evolving organizations must match the pace of change, fall behind, or lead the pack. That's the existential issue at stake in today's digitally-infused times, where bold action must be actively supported by out-of-the-box experimentation and pathfinding. Ths must be done while managing the inexorable daily drumbeat of operational issues, service delivery, and the distracting vagaries of the unpredictable, such as a major cyberattack or information breach. The CIO this year must be both a supremely masterful priority juggler and an effective digital leader from the front. The CIO will have their best-ever opportunity to partner with the CEO and the board. The reality is that most executive teams still lack qualified digital expertise at the leadership level. This is hampering strategic decision making across the enterprise when it comes to becoming a digital native organization. While the CIO can still be perceived as being from the old guard (i.e. IT as a cost center and support unit, or "part of the problem"), the data shows that more CEOs are now picking up the primary mantle of digital transformation, more so even than CIOs today. This creates a unique opening this year for the CIO to become a parter with the CEO and whomever else is driving digital transformation in the C-Suite and board of directors. While I have often encouraged the CIO to foster digital leadership skills, now is the best time to use them, to become a trusted advisor with an equal seat at the top table for mapping out the digital future of the organization. The CIO is uniquely equipped by virtue of understanding the needs of the business, owning many or most of the IT systems that run the business, and managing the invaluable data sets within them. CIO must successfully become what many were hoping the Chief Digital Officer (CDO) would become (though many have): Reinventing the organization as a true digital business and technology company. CIO attention will focus on customer experience like no time before, and collaboration with the CDO and CMO will grow. I have argued that today's continued deconstruction of the enterprise value stream into functional silos (marketing, sales, operations, delivery, customer care, and innovation/R&D) is no longer effective in a world where seamless customer experience is the most important discrimating factor for how a business will perform. In 2019, the CIO will need to help the organization make the transformations well beyond just solving the myriad problems with fragmented and disjointed digital touchpoints themselves. Instead, the CIO will need to begin tackling the tougher underlying problems in involved in creating a more integrated customer experience stack. This means creating genuine master data out of the dozens, and often hundreds, of the poorly integrated or disconnected digital platorms used to serve customers today. Then help the organization restructure the end-to-end customer experience capability from an org structure and process perspective. This won't be completed in 2019, and may take years, but the imperative is clear that getting the customer experience house in order will be absolutely required to thrive and grow, now and even more so in the future. This will require closely working in concert with other C-suite leaders, particular the CDO, CMO, and the Chief Customer Officer (CCO), which a great many CIOs this year will do. Cybersecurity will dominate operational reality, budgets, and management attention, closely following by digital regulation. For anyone keeping score, the sheer scope, seriousness, and breadth of cybersecurity breaches in 2018 showed that virtually all organizations are vulnerable. Consequently, nearly all CIOs will need to continue to up their game this year to invest time and some of their very best resources in keeping the organization safe. Getting caught up in a serious cybersecurity breach is now a career ender for the CIO and his/her peers, never mind the real and most important issue: The safety and privacy of customers, workers, and business partners themselves. This is an easy prediction, but I forecast that 2019 will ring in even more serious breaches and cyberattacks than 2018 as perpetrators continue to get more organized, often aided by the sheer connectedness of tech today. IT leaders need to exert themselves not only on the technology front, but in education and communications both upwards and downwards on prevention, preparation, and response, as well as scale up on-demand incident management teams and proactively exploring emerging security technologies such as AI-based adaptive detection and defense tools. Regulatory concerns such as ongoing work to ensure new and legacy IT systems comply with GDPR or California's new data privacy law will also be high on the list this year, as these regulations have emerged in key operating environments. There are potentially serious ramifications for compliance failure, as it's expected that regulators will begin ruling more actively this year. Digital transformation will become/remain a shortlist corporate priority, but most CIOs will be expected to proceed without (sufficient) new resources. It's a surprisingly little known fact outside the CIO's office that most of the IT budget is used to keep existing systems operating, supported, updated, and maintained. This leaves only minor budgets for innovation or creating new digital lines of business. In an era of all time high tech change and a corporate imperative to disrupt or be disrupted, most CIOs are only seeing single digital IT budget increases, despite often profound talent shortages and mountains of rapidly aging legacy systems/technical debt . I predict more CIOs will make bolder cases for more investment being routed to them for digital innovation initiatives, which is often happening outside of traditional IT today. The upshot: Tech spending is way up, it's just often not being given to the CIO. Leading CIOs will reclaim more of this funding for themselves and ensure it gets used effectively. Yet there is good news too: We now see that many vital elements of digital transformation that can be addressed without major new investment, from developing an enterprise-wide microservices strategy to steadily and proactively improving the master data story in an operational way. These two alone will enable the next generation of growth-creating digital experiences to be developed much more easily, quickly, and inexpensively. I've long observed that the most successful examples of digital transformation have a strong foundation story, often years in the making. At the very least, the CIO can prepare in this way during 2019 as the budget situation is improved this year. The CIO will be increasingly leaned upon as an innovator well beyond IT, but many will be relegated to a second-tier technology infrastructure executive role instead. More will be expected of the CIO in 2019, even as they wear too many hats already. I've explore the new CIO mindset in the past, but as digital infuses virtually every aspect of the business, the CIO no longer has nearly as much direct control over the use of the technology. Instead, as my good friend and IT leadership maven Mary Fran Johnson observed at CIO Perspectives last year in Virginia, influence must now be cultivated and wieldied "as the most important single role" of the CIO today. My prediction: This will be even more true this year. CIOs that are ineffective at using influence to cultivate change agents and drive progress across the organization as well as within the business itself will increasingly be pushed to the margins. CIOs with limited influences will have roles focused more on day-to-day technical functions of cybersecurity, infrastructure management, and business continuity instead of leading the business-focused digital transformation of the organization from the front. It will be a difficult year for CIOs to speed up digital change, as digital "tablestakes" continue to rise faster than solutions are found to become more agile, especially with emerging technology and big tech. The need for IT to move faster and meet stakeholder needs better has been a long standing issue (94% of CIOs I surveyed recently say they have strong or very strong pressure to move faster.) Some have predicted that traditional IT must ultimately break unless new ways are found to move quickly and more responsively. While advances like agile methods and devops has helped, we're going to need solutions on an entirely new scale. I predict the next-generation of IT service management will be forced to evolve quickly in 2019 to be more self-service, inclusive of far more cloud and mobile solutions, and behave much more like a responsive and useful enterprise app store than an frustrating, unsatisfying service desk, IT liason conversation, or procurement process. ITIL 4.0 is finally coming this year, but it won't have much impact in 2019. Instead, I predict that fundamental and outside-the-box rethinking of how IT can reduce time-to-value will be more prevalent this year. Breakthroughs will sorely be needed as tech leaders like Amazon, Microsoft, Google, and Elon Musk's companies continue to set the global pace, even creating real concern with CIOs that they will move next to compete directly in their own industry. Scarcity of talent will grow and continue to plague new IT initiatives, but some progress will finally be made on alternative talent sourcing. Powerful and rapidly maturing new technologies like big data analytics, Internet of Things, artificial intelligence (AI), and blockchain, to name just some of the most significant all offer the potential to create game changing competitive advantage for organizations. The technologies are available and improving rapidly, but the talent to turn them into effective tools for the business is usually not available in sufficient numbers. High demand for skilled IT staff has resulted in what is effectively negative unemployment in many sectors of the technology and IT worlds this year. CIOs will have a tough job acquiring the talent they need, from technology specialists in these areas, to mid-level and senior managers who can manage the increasingly complex delivery dynamics and web of interdependencies inherent within modern IT solutions. These are increasingly crafted out of an ecosystem of existing IT systems, corporate databases, 3rd party systems, open APIs, and open source software solutions and require those familiar with these many different sources of data and functionality. I predict that instead of competing for talent with the Amazon, Google, and Apples of the tech world, CIOs will move more toward cultivating higher impact educational resources for existing staff. These include aggressive apprenticeship programs, just-in-time online skill building, formal mentoring efforts, internal hackathons, and incubator programs to encourage development of skills, hands-on with the latest tech. I also see a trend that CIOs are demanding better learning resources from their vendors and CHROs both as well. Some of the former, like Salesforce, have actually stepped up with popular upskilling solutions like Trailhead. More vendors are following and IT leaders will embrace them. I predict the IT industry will also see much wider use of emerging new on-demand talent sources like gig economy techical marketplaces in 2019. Vendor management will be seen to require a fundamental reworking as more IT shifts to SaaS and public cloud. As the gap between IT and the systems that the department actually oversees continues to grow wider -- I'm talking about the separation between IT and the actual resources it uses, which are moving steadily to the public cloud -- the issue of control has begun to return. This is because more and more net-new IT systems run mostly or entirely in the public cloud. Topics like outage management, vendor transparency, communication, responsiveness -- and ultimately, trust -- are taking on all new levels of importance when there's little IT can do except hope that a cloud vendor handles key operational events well when they occur. Getting a handle on service level management of these systems has become steadily more urgent given the sheer number of cloud-based applications and services most organizations use today. Service-level agreement (SLAs) have become a primary operational artifact that must be measured and managed far more closely by both sides. Over the last year, I've heard from the CIOs that I speak with and advise that there is a real desire for improved measurement, automation, and enforcement of cloud service levels. SLA analytics for public cloud is now becoming an industry and is becoming a growing part of the IT service management world. However, I do not expect better and more transparent SLAs to appear widely from cloud vendors yet, other than tweaks to the current uptime/outage dashboards that most of them provide. Instead, what I do see happening this year is steadily growing pressure on cloud vendors to start to offer some version of a "build-your-own-SLA" from templates containing acceptable ranges of parameters based on cost. The cloud has always risked cutting out the middleman, IT in this case. So without some level of control and configuration, IT's role becomes less valuable, even as it should remain the key responsibility that better adapts such solutions to the business. Thus, more variability and control over the service level details and compliance levels of cloud subscriptions will be an increasing push this year. Active governance, backed with data, over cloud SLAs will help sustain IT's relevancy well into the future. The push for automation, especially with AI technologies, will expand both within the CIO's own purview, and become a widespread priority with the most internal stakeholders to-date. It turns out that a key strategy to achieve a lot more in IT while experiencing relatively flat budgets is simply to automate more of what IT does. I'm on record saying that by 2025, 90% of what a CIOs is responsible for must be automated, just to tread water on existing service and staffing levels. But since the hype cycle began on machine learning and AI, automation has captured the imagination of business stakeholders like few other times in history. Helping drive this demand, technologies such as robotic process automation are maturing to the point that they can be rapidly fielded to automate nearly every type of rote business process or activity in fairly short order. The business benefits are considerable as the latest data shows as well, particularly in IT, surprisingly. I predict that rapidly increasing level of automation, both in IT and across the business, will be a top 5 focus for most CIOs in 2019, even if it isn't always called by that name. Employee experience will continue to see underinvestment, particularly in mobile solutions, leading to shortfalls in realizing digital experience for key stakeholders, even as emerging approaches create new promise. 2019 is the year that a high water mark of CIOs will conclude that their digital workplace is a mess, as applications and IT services continue to accumulate. I've seen an concerted effort in some organizations, mostly larger and more well managed enterprises, that are attempting to make a more holistic and integrated experience from what is essentially becoming a grab-bag of formally sanctioned productivity and business applications, mobile applications, and shadow IT. One approach is to create more designed end-to-end experiences around high value processes built on top of existing IT systems, or provide intelligent "super portals" that bring all the applications and data together into a more organized and searchable model. The right answer depends on the organization naturally, but I actively see leading CIOs experimenting to find the right combination of new approaches for employee experience in 2019. I am also sanguine for the likelihood that contemporary "intelligent" intranets, or even enterprise social networks and team collaboration platforms, are good centers of gravity for the overall employee experience. The data to bear out the most popular and effective target platforms for holistic employee experience will start to emerge this year as well. The post-ERP era has arrived, and build vs. buy is back on the table as organizations seek to build their new Digital Core. The rise of highly effective low code tools combined with a great many IT products having APIs and/or microservices that make them readily reusable and recomposable, has led us to a strange path down from the mountain of long-held truth better known as "don't customize IT (especially ERP) systems, it's almost never worth it." Most companies now have well deployed, yet increasingly aging, ERP systems that now run much of the day-to-day business. With the rise of digital cores, it's not clear that organizations are well served by an ERP-focused system any more. Instead, as I've explored above, digital experience has become the new measure and digital boundary over which value is created and exchanged. Organizations now seek less monolithic systems and instead want to be able to access digital business functions and data in a way that can be projected into any touchpoint or experience. Low code tools and integration-platfoms-as-a-service (iPaaS) make it quite straightforward to weave just-in-time applications that meet stakeholders needs in short time periods, even for one-off processes in way that's cost effective. In the post-ERP era, data, services, processes, and experience that are well structured, shared, and accessible are becoming the differentiator and force multipler. I argue that this is enabling a much-needed new generation of experience creation to emerge that is highly industrialized and scaled. Instead of customization, new on-demand experience creation will provide the better significant strategic advantage in the near future. This will unleash mass customization, personalization, and perfect fit solutions. In 2019, I predict CIOs will be investing in exploring their options to create this important new fabric for growth and value creation/exchange. Multicloud will be a pervasive reality for most organizations, CIOs will push for more ways to take advantage of its benefits. Every organization today is multicloud, they just often don't fully realize it. IT organizations are inheriting whatever public cloud their SaaS and mobile application providers are using, plus whatever shadow IT and departmental apps use that are outside of IT control (see: the CMO's martech portfolio.) But CIOs are at last concerned about having their data and SLAs in so many buckets, and often not even having a grasp of which buckets. As more enterprise cloud vendors allows Infrastructure-as-a-Service (Iaas) to be swapped out of the bottom of their application stack with the customer's preferred commercial cloud of choice, there will be more motivation to understand multicloud dependencies in modern IT. This will lead to economy of scale and arbitrage of cloud capacity to the benefit of the business. Expect multicloud to be a hot topic for both governance and control as well as cost management in 2019. Any single predictions list is likely going to leave out some interesting ideas. For example, I don't see CIOs engaged much in culture change for digital and so it's not listed here, but that is clearly one of the main obstacles to successful digital modernization and transformation. So please leave your own CIO predictions in comments for discussion below, or on LinkedIn or Twitter.